Reduce your travelling times drastically and make a stylish entrance. T in the Park will be at Strathallan Castle, Strathallan, Perthshire and offers a huge variety of music across seven main stages. Reduce your travelling times drastically and enjoy the luxury and comfort that comes with a stylish entrance by flying to T in the Park. With a flight from London only 35 minutes this is the quickest way to get to this music extravaganza, in fact, the trip is probably quicker than most albums! 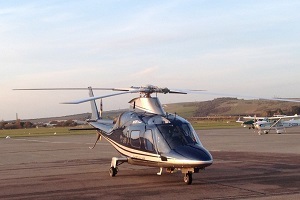 With complimentary champagne and light catering, you and up to five friends can quickly and comfortably fly to the festival from a location of your choice and make a vertical arrival in in one of Atlas’ aircraft such as this beautiful Agusta 109e (pictured). This music festival becomes more accessible to those on the south coast, in London and elsewhere in the UK as you can avoid a long arduous drive, possible rail delays or scheduled infrequent flights. Avoid the traffic jams that result from the 85,000 or so music fans that attend, all of whom are trying to get to the venue at the same time. T in the Park encourages festival-goers to camp and to bring camper vans for the weekend. This means the roads will be slow going before, and especially after, when everyone tries to leave at the same time. T in the Park, besides the music, provides a funfair, a comedy tent, stalls, food markets and a campsite with a cinema screen which features retro and modern classics. Call our team now on 01256 635000 for more information about flying to the music festival of your choice.